An artist’s depiction of the momentous signing of the Declaration of Dependence. 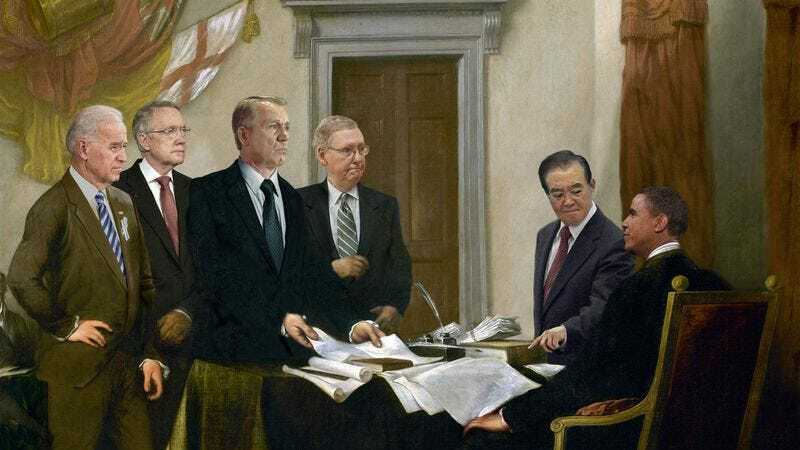 WASHINGTON—In what is certain to be regarded as a defining moment in the nation’s history, leading U.S. political figures gathered at the Capitol today to sign their names to the newly drafted Declaration of Dependence, formally proclaiming America’s total reliance on China. The revolutionary pronouncement, which was ratified unanimously by representatives from across the United States, calls for formal recognition of American dependence and enumerates more than two dozen of the country’s specific dependencies on China, including a $282 billion trade deficit, the $1.15 trillion in U.S. bonds held by China’s central bank, and the fact that each of America’s 314 million residents would be utterly helpless without access to Chinese-produced clothing, plastic goods, and electronic devices every moment of every day. In addition to codifying how U.S. money and resources will be transferred directly to China, the document, handwritten on parchment, lays out how the Chinese government will henceforth officially dictate America’s domestic spending, foreign policy, the value of the dollar, and, in essence, the incomes and the very well-being of American citizens themselves. Signatories to the declaration—among them President Barack Obama, all Republican and Democratic congressional leaders, and members of special delegations sent by each of the 50 states—reportedly delivered speeches backing the forfeiture of U.S. sovereignty to the Chinese government before gathering around a wooden table in the Senate chamber to authorize the landmark document. According to sources, President Obama, now widely hailed as the father of American Dependence, authored the text over the course of 17 days, toiling by candlelight late into the night as he composed multiple drafts in an attempt to construct the purest representation of the American people’s wholesale subservience toward China. Although politicians reportedly clashed over clauses in early drafts, such as exactly when to fully dismantle the U.S. manufacturing sector, all signatories, regardless of political party or ideology, are said to have come together in a rare display of unanimity to stand behind the final wording of the Declaration of Dependence, which includes a Mandarin translation on its reverse. Following the proclamation’s signing, the pealing of bells could be heard throughout the country, as cheering citizens gathered in town squares nationwide for public readings of the document’s text. Many were reportedly overwhelmed with emotion at the official declaration of a conviction they had long felt in their hearts, while countless others proudly waved American flags manufactured in China. According to reports, an official copy of the declaration, which praises Chinese president Hu Jintao by name and pledges undying fealty to him, was dispatched immediately to Communist Party headquarters in Beijing, where the proclamation had been eagerly anticipated and was received with great satisfaction.